The line is a kind of extruded snacks, using corn grits as raw materials meanwhile mixing with water and oil,very crunchy and great in taste. 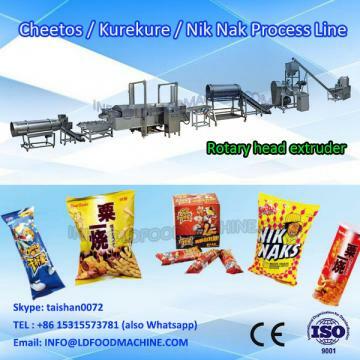 Kurkure/Cheetos snack food is made by extrusion process. 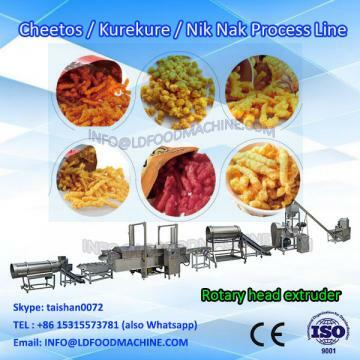 The snack food are moisturized in a vertical mixer with water, oil then feed to the Rotary Head Extruder. In the extruder, due to excess heat and pressure from the screws the meal gets heated and the moisture content gets reduced. The meal passes through the die and gets cut by the cutting knifes into required lengths. The kurkures/cheetos snacks food is fried in cooking oil and then cooled before flavoring. Seasonings are sprayed on the kurkures snack food to improve their taste. To extrude and inflate the food. coating the flavoring powder on the kurkure snacks food surface after frying . 2. 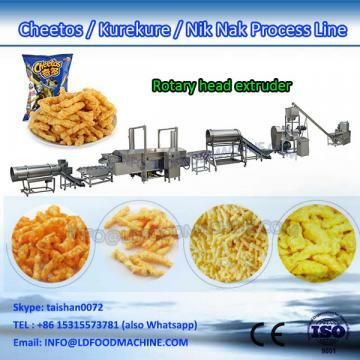 When we received your deposit of this order, we will ask our engineers to prepare to apply the visa, when food processing line arrived your country, and we will send two engineers to go and help you to install the fried snack food line, teach your worker(3-4 workers) how to operate the food line, until your worker know the food line well. 4. Our engineers can provide basic formula for producing the snack food and help customer to produce good quality food according customer’s detailed formula.